Ypsilanti has a stellar new dining destination! I may be an Ann Arborite, but I frequently dine in Ypsi as well, mostly due to our nearly weekly trips to Sidetrack to redeems the huz’s free year of burgers. 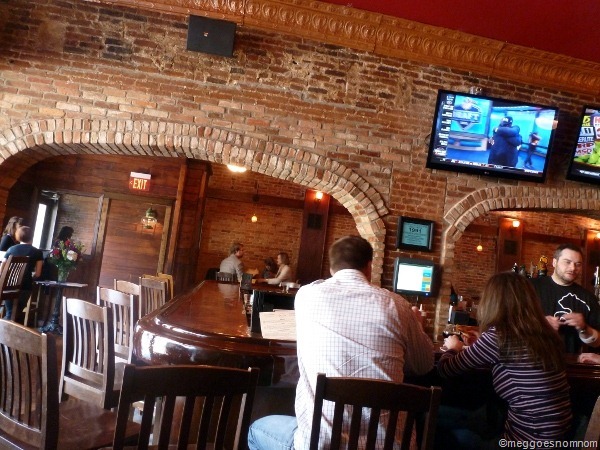 Also last weekend we dined in Ypsi’s also-new Wurst Bar. 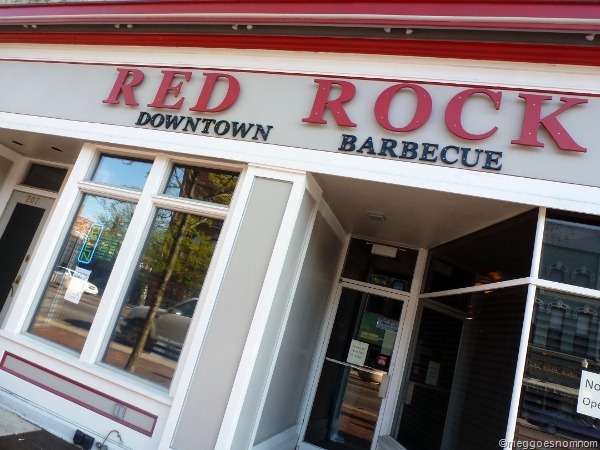 This past Friday we headed to downtown Ypsilanti for the opening of Red Rock Downtown Barbecue. I read that Red Rock had it’s “soft” opening one week ago, and had been running on a limited menu until the day of our visit – the Grand Opening. The interior is just gorgeous. I absolutely love it. The colors remind me of my living room. So my style – great rich color, variety of appealing textures, from wood, to black leather, to exposed brick, nice lighting, and a welcoming atmosphere. Large variety of beers on draft, most of which are Michigan-crafted (and a few exotics from Sri Lanka and the Czech Republic). 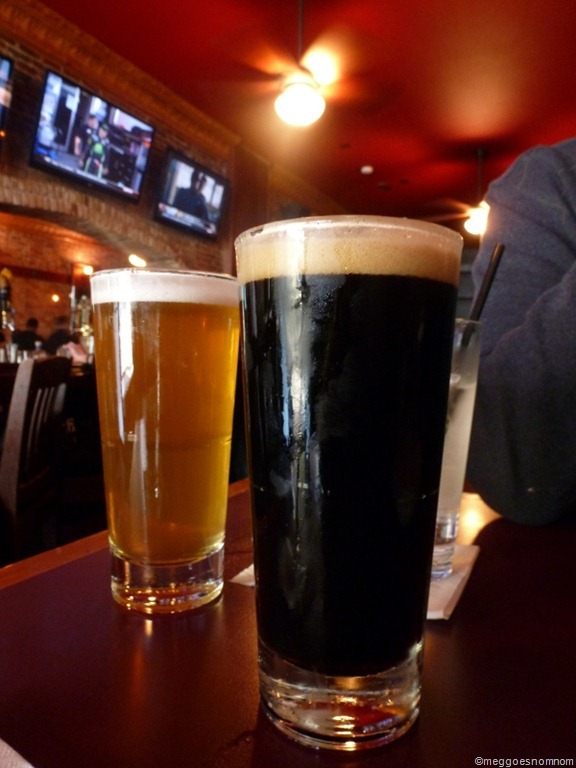 Bell’s Double Cream Stout for me – a favorite of mine, basically my perfect beer. It is just so luscious. Tons of bar seating! Love it. The bar was nearly filled by the time we left. 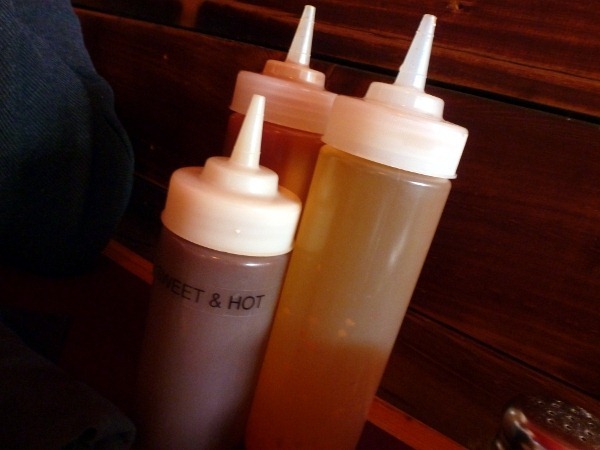 A trio of barbecue sauces at each table. 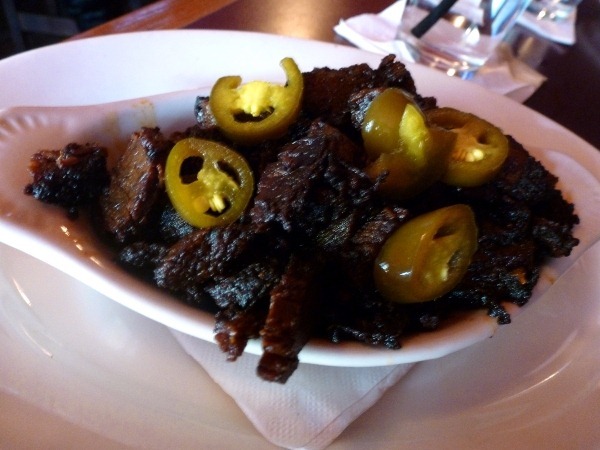 To start, we ordered Burnt Ends, which, according to the menu, are “cured and double-smoked, dry rubbed brisket ends.” The jalapeños were an ingenious addition. These were tasty, but a little heavy as a starter for me, personally. Loved the rich smokiness, though. Red Rock’s menu is quite straight-forward, and you know that I am a fan of that. In addition to a handful of starters, a few salads are offered, five sandwiches, five entrees, and a variety of sides that can be paired with the entrée meats. 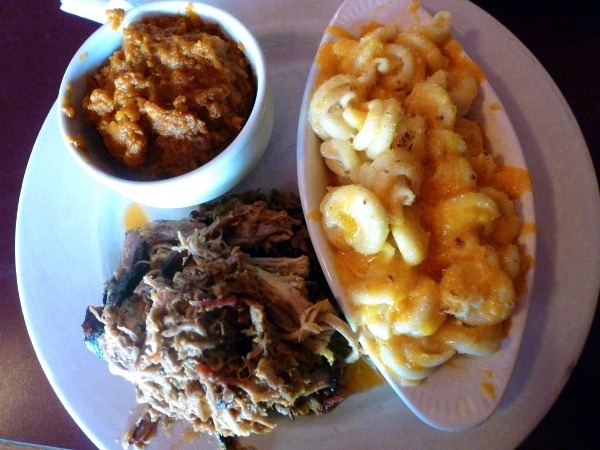 I ordered the Pulled Pork entrée, which came with two sides of my choice: Mac N Cheese and Sweet Potato Mash. The Pulled Pork was delicious, and as promised, very tender. It was pulled to rather small pieces, though a few larger chunks were left as well (I like those!). I loaded up the smoky pork with Sweet & Hot barbecue sauce (a great sauce!). The Mac N Cheese was also great! Not super creamy, but very cheesy, and I loved the uniquely-shaped pasta. I was also a huge fan of the Sweet Potato Mash! I’m not usually a huge fan of overly-sweetened sweet potatoes and fortunately these were not; these had an amazing flavor and lusciously smooth texture. I was extremely impressed with the large portions sizes of, well, everything. For the price (all of which were quite reasonable), Red Rock could totally get away with decreasing their portion sizes, because I could barely eat half of this plate before my belly was at capacity – not even room for dessert, which is a rarity! The huz ordered the Smoked Half Chicken, and while I loved my Pulled Pork, I had a bit of food envy after trying his chicken. I believe I declared the chicken was not only “incredible,” but also “spectacular.” Uh, yeah. That good. Best thing we tried! Cowboy Beans and Cornbread were the huz’s two side choices – both were very good, but especially the cornbread, which was moist and dense, and had whole kernels of corn within. Again, huge portions! We both had enough leftovers for a hearty lunch the next day – hey, no complaints here. I was also extremely impressed by the service we received at Red Rock – spot on, from start to finish. Considering we visited during the grand opening, I am even more blown away. Friendly, attentive, helpful… A+! I literally cannot come up with any flaws. If I HAD to, the only thing I could say was maybe the fact that we had to find street parking was a con but we are used to that anyways, living in Ann Arbor. Plus it is MUCH easier to park in Ypsi than Ann Arbor. I went there today and was very impressed, especially given the short amount of time they have been up and running! Brisket was very good and beer selection was top notch. I did not even realize Salt Lake City had a brewery?!?! (Epic Brewery). Nice job! i keep on hearing about this place. i need to go! Pingback: Veggie Face Plant « Meg.Goes.Nom.Nom. Ahh, yes, that’s what I get for using annarbor.com as my info source, instead of doing the legwork myself. It’s good food, can’t blame you for frequently returning! We ate here the week before the grand opening and everything was great! The staff were friendly and efficient, the food was excellent – I have no problem with the large portions, that just means leftovers! They didn’t have dessert the night we were in, but we’re looking forward to our next trip and trying some new items and their sweet offerings. Love that there’s great bbq close to home! Dessert is on our to-do list as well! Hey, i’m in the second picture. Where’s my royalties? 🙂 Great food!! I went recently to the Red Rock when I was in Ypsi. They done a fantastic job at opening the place up and creating an atmosphere that really is welcoming. As many know, I was the musician that played with TY Cool for over 10 years at TC’s Speakeasy, and was part of the wood work along with others that helped to make the old place “TC Speakeasy”! The Red Rock is it’s own environment, and I hope that they turn what they have into their own creation as we did decades ago. We had to much fun, and I want the Red Rock to have even more fun than we had! Thanks for commenting! 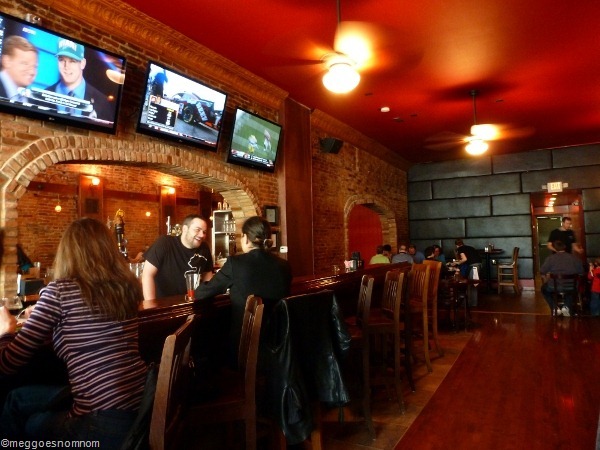 I agree that the Red Rock founders have done a commendable job at establishing and renovating their own new place in an already-awesome space! Pingback: Breakfast at The Bomber « Meg.Goes.Nom.Nom. I FINALLY got to check this place out. Loved it. The burnt ends we’re really good as was everything else. Brisket and ribs were perfect. I actually think its much better than Slows in Detroit. 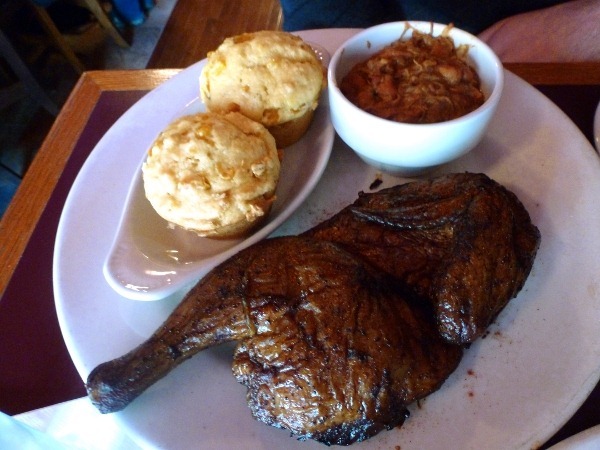 Meat and sauces were on par but RR’s sides were 110x better, esp the cornbread. I like the beer selection, too. Only downside was wines. No listing an waiter had no idea what they had. Maybe they don’t get many people ordering it there, but a nice zin would’ve been great. It’s the classic pairing and they didn’t carry any. Good thing I love beer, too!! Yeah, RRBBQ is awesomeeee! Glad you liked! Pingback: Slows Bar B Q of Detroit | Meg.Goes.Nom.Nom. Pingback: Dinner Meal Plan for March 30-April 5 | Meg.Goes.Nom.Nom. Pingback: Dinner Meal Plan for September 22-28 | Meg.Goes.Nom.Nom.